Transparency Market Research has released a new market report titled “Shared Mobility Market – Global Industry Analysis, Size, Share, Growth, Trends, and Forecast, 2018–2026.” According to the report, the global shared mobility market is expected to expand at a CAGR of about 8% during the forecast period. The automotive industry is witnessing a trend of connected, electrified, and shared mobility, which is attributed to the increased consumer awareness about global warming due to vehicular emission, increased government emphasis over alternative modes of transportation, and OEMs’ shift toward advance mobility solutions. The cost of using shared mobility is much lower than that of owning a vehicle and hence, a large number of consumers and passengers are preferring shared mobility solutions instead of investing in owning a new vehicle. Less number of vehicles per 100 people, increase in number of daily commuters heading to workplaces and homes, increased burden on public transportation facilities due to rapid urbanization, and lack proper connectivity of public transportation systems are fueling the demand for shared mobility services. Adoption of smartphone-based internet services is rising among consumers primarily due to the increased usage of smartphones, ease of operating the app, faster internet connectivity, and presence of globally leading and local service providers coupled with lower charges of services compared to private services. Public transportation facilities across the globe are failing to cater to the need due to increasing urbanization and increasing population. Increase in number of working class people, rise in income opportunities, increase in per capita income coupled with increased tendency to travel for work and holidays are fueling the demand for shared mobility services across the globe. The organized sector accounts for a large amount of revenue generated from the passenger transportation services. The share of organized sector varies according to the adoption of advanced technologies, adoption of smartphones, and availability of faster internet services coupled with awareness about internet-based service providing companies across the country. Countries from Europe and North America are well-developed and witness extensive adoption of advanced technologies and smartphones. Availability of faster internet connectivity and presence of globally leading service providers coupled with higher rate of adoption from consumers led the organized sector to hold a major share of the market in North America and Europe. However, in other regions, the unorganized segment accounts for major share of the market, in terms of revenue. Vehicles utilized in the unorganized sector are generally privately owned. These are considered as private services, as the unorganized services cannot be availed through internet or smartphone-based apps. Ride sourcing is an emerging trend across the globe, in which consumers can book a ride via a smartphone-based app. Ease of operating the app, increased penetration of smartphone users, and availability of reliable internet services are fueling the demand for ride sourcing services. Ride sourcing services are flexible, thus a large number of consumers traveling to workplaces, homes, to restaurants, and colleges prefer ride sourcing services. Thus, the demand for ride sourcing services is increasing owing to the rise in working class population. 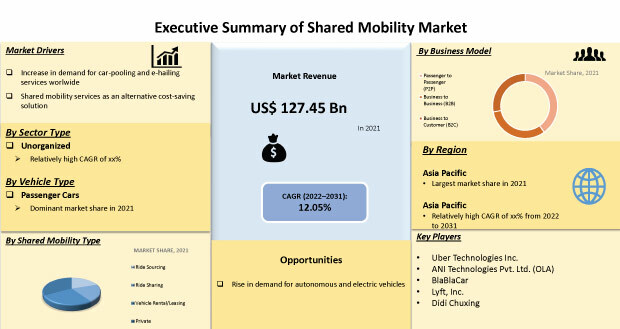 Lesser number of vehicles per 1000 people, lack of proper public transportation facility, crowded public transportation, and increase in fuel prices coupled with no necessity of driving are fueling the ride sourcing segment of the global shared mobility market. The ride sourcing segment of the market is anticipated to expand at a CAGR of about 23% during the forecast period. Passenger cars are widely adopted for passenger transportation services. Maneuverability, requirement of smaller space, exemption from several taxes, higher fuel efficiency, and lower cost of passenger cars make them suitable for passenger transportation services. Demand for SUVs is rising among consumers, which is attributed to consumer preference for off-road journeys, larger space in the vehicle, and development of new types of SUVs. Large number of passenger cars utilized for passenger transportation services are owned by individuals who are willing to share their vehicles. Such services are considered as P2P services. Large share of passenger cars has led the P2P segment to hold a major of the global shared mobility segment. Legality of P2P services, increased per capita income of individuals coupled with willingness to share their vehicle, exemption from road taxes in several nations for passenger cars, and increasing demand for ride-sharing sourcing services rather than vehicle rental are fueling the passenger cars segment and subsequently, of P2P segment of the market. Advanced driver assistance technologies have proven to be highly effective in reducing the number of accidents occurring due to driver errors. Consequently, regulatory bodies across several nations are mandating several ADAS technologies into vehicles. ADAS technologies, such as lane keep assists and adaptive cruise control drive the vehicle automatically; consequently, consumers are preferring such semi-autonomous vehicles. Consumer demand for increased in-vehicle safety, incorporation of ADAS technologies at manufacturers end, and regulations implemented from governing bodies are fueling the demand for semi-autonomous vehicles across the globe. Demand for electric vehicles, also considered as zero- or low-emission vehicles, is rising across the globe primarily due to the considerably lower operating cost as compared to that of conventional vehicles, heavy discounts and incentives offered by governing bodies, announcements to implement a ban over the use of fuel powered vehicles, and availability of electric vehicle manufacturers. The paradigm shift of governments toward building electric vehicle charging infrastructure is fueling the demand for electric vehicles. Therefore, electric vehicle segments, such as hybrid electric vehicle (HEV), plug-in hybrid electric vehicle (PHEV), and battery electric vehicle (BEV), are anticipated to expand at a significant growth rate during the forecast period. The rate of adoption of battery electric vehicles is increasing significantly among consumers, which is primarily due to the decline in prices of vehicles, increase in range of batteries, and heavy subsidies and incentives from governing bodies coupled with expanding charging infrastructure. Demand for shared mobility services is rising considerably across countries that have lower number of vehicles per capita and lack proper public transportation facilities. China and India are countries with large population and have lower number of vehicles per 1000 people. Rapid urbanization in these nations is increasing the burden over public transportation facilities. Therefore, passengers are preferring alternative modes of transportation. India and China account for a large unorganized passenger transportation sector; however, the demand for organized services is increasing owing to the rising awareness among passengers, better internet connectivity, and increasing smartphone usage. Increased road traffic congestion, implementation of stringent emission norms from governing bodies in order to curb pollution level, and rise in working class population heading to workplaces and homes are fueling the demand for shared mobility services across the globe. Key players operating in the global shared mobility market include Uber Technologies Inc., ANI Technologies Pvt. Ltd. (OLA), Lyft, Inc., Grab, Careem, Taxify OÜ, Gett, Beijing Xiaoju Technology Co, Ltd. (Didi Chuxing), BlaBlaCar, Wingz, Inc, Curb Mobility, Cabify, Europcar, The Hertz Corporation, Avis Budget Group, Inc., and Enterprise Holdings, Inc. The global shared mobility market is witnessing an increase in merger and acquisition as well as integration activities. Several auto manufacturers have entered the shared mobility market. Shared mobility is considered as a niche market despite the high level of competition.